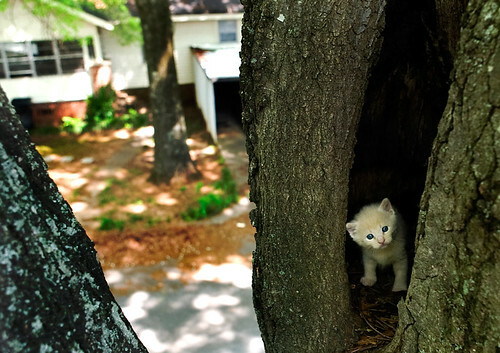 A kitten peeks out of the split of a tree on 9th Street SE on Tuesday, April 22, 2008. The kitten was born in the tree and mother "Tinkerbell" visits this and another kittens to feed. The felines belong to Nancy Quintavalle who lives at the residence. Quintavalle worries that bees that make a hive annually in the tree will return before the kittens exit the 40 foot arbor refuge.